How many browsers is many? 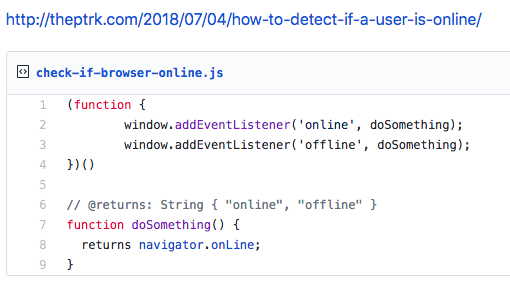 caniuse says every major browser (Chrome, Firefox, Safair, IE11…) except Opera mini has this functionality (as of July 4th 2018). How can I check the online status? How can I listen to events? BE LOUD ABOUT NOT BEING ABLE TO SAVE. Be like workflowy*. Tell the users, make them listen. You will likely need more error handling than this. 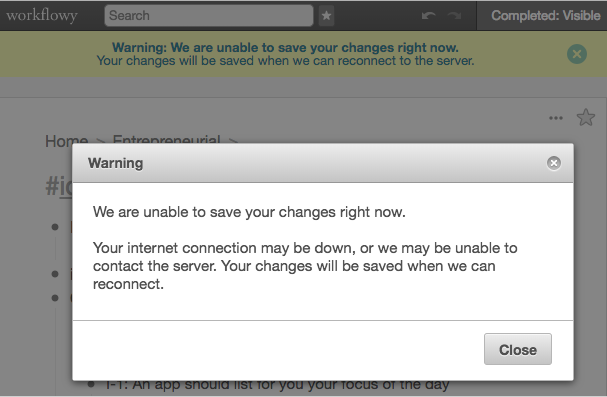 For example: what if your server is offline? what if the request body has malformed? what if the server is up but your database is down? what if the api hits a 404 and do you let your devs know about this?